If you are going through Foreclosure you need to make sure every decision made from this point on is the right decision for you. This means above all you must get a handle on your emotions to ensure every choice you make is strategic and not done on impulse. Read my letter to UDoLegal's users and take the time to follow my advice and catch up with the latest Foreclosure Defense news. If you are going to have any chance of saving your home you must make it a rule every decision you make be an informed decision. In buying this book you are not only arming yourself with the information you desperately need -you are taking the first step in a strategic plan to save your home. 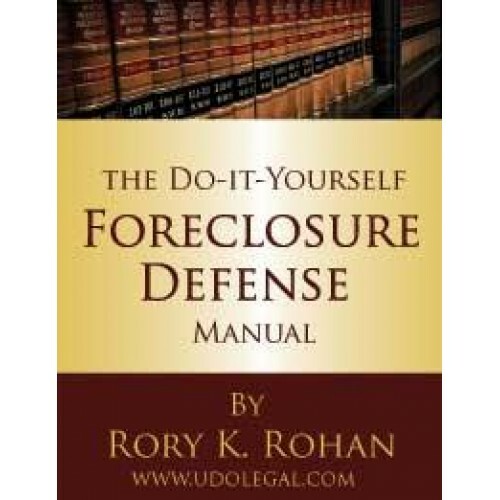 The book contains every letter, pleading, discovery form, motion to dismiss, answer and counterclaim that you will ever need to prevent, stop or postpone a foreclosure on your home. It also takes into account you probably have no idea what most of that means and goes in to detail giving instruction about how to use each and when each will be needed. It also discusses topics you should be familiar with like - the banking system, pitfalls of loan modification, and why short sales only help the banks. You'll notice this section of the site offers the book in a variety of manners. Most of the difference lies in the form the material than specific differences in the information itself. Some people want a book they can hold, others may want immediate access via download, while yet others may wish to dispense with the how-to parts (mostly attorneys themselves) and may just want the forms that have taken me many years over the course of my career to collect, organize and refine. The book in download form only in both Adobe PDF and Microsoft Word Format. 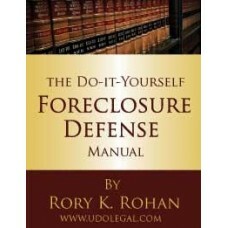 Over thirty years as an attorney, developer, construction contractor and real estate professional gives Mr. Rohan a unique perspective in defending foreclosure matters. Rory was educated at the prestigious University of Florida Warrington School of Business and at the renowned University of San Diego ALCALA School of Law, both excellent institutions of higher learning.